= Hang in there, Japan!! It has been 2 weeks since the earthquake hit Japan. We all have deep pain and sorrow in our hearts worrying about the people in the most affected areas. Under these circumstances, it is easy to feel fear, sadness, despair, and depression. But I don’t want to make a lesson based on any of these negative emotions. Instead, I would like to focus on people’s inner power and their kind hearts. Today I would like to make a lesson to cheer us up! First take a look at the picture above. = Hang in there, Japan! Note : 日本 can be read “Nihon” or “Nippon”. But when we cheer, we tend to use “Nippon”. We say this to encourage someone (or even yourself!). = Hang in there! / Good luck!/ Keep it up! = Good luck with your Japanese! =We (or I) should hang in there. When you say がんばって(下さい）！= Ganbatte (kudasai)! がんばれ！= Ganbare! it often implies the feeling of wishing “Good luck!” showing your support. = Hisaichi no hitotachi ni ganbatte nante ienai. Ganbaru nowa bokuara dakara. Motto watashitachi ni amaete kudasai. = I can’t say “Hang in there” in the afflicted areas. It is we who have to work hard. Please let us do what we can. It is so true. All the victims of Tsunami and earthquake have been がんばっている(=ganbatteiru), putting up with everything. We, all the Japanese people are the one who have to がんばる(= ganbaru)to support them and Japan from now on. And we hear all the encouragements from everywhere now. = We should hang in there, Japan! = Hitotsu ni natte kono kabe wo norikoeyou. = Become one and overcome this wall. = We and everyone is with you. Athletes have organized “Team Japan” to support Japan. An AC commercial with soccer players. = Chiisai koro Hanshin daishinsai wo keiken shimashita. = I experienced the Great Hanshin Earthquake when I was little. = Nihon no tsuyosa wa danketsuryoku desu. = The strength of Japan is its bond of solidarity (=team work). = Boku mo seiippai doryoku shimasu. = I will do my best. = Hitorijanai minna ga iru. = You are not alone. Everybody is with you. = Sekaijuu no hitotachi ga nihon wo ouen shite imasu. = People around the world are supporting Japan. = Minna ga egao ni naremasu you ni. = Hitori hitori ga dekiru koto wo yarimashou. = Let’s do what we can do individually. = Nihon ga hitotsu no chiim nan desu. = Japan is one team. = If we work together, it will be powerful. People have been passing around a quote of a folksong singer 松山千春 (= Matsuyama Chiharu) on Twitter. The 全国高校野球選手権= Zenkoku koukou yakyuu senshuken = The National High School Championship at 甲子園球場 = koushien kyuujou= Koshien Baseball Satdium has just opened. And here is a speech of the opening ceremony. = Watashitachi wa juurokunen mae Hanshin Awaji Daishinsai no toshi ni umaremashita. = Watashitachi no kokoro wa kanashimi de ippai desu. = Nakama to tomo ni ganbatte oraremasu. = Norikoeru koto ga dekiru to shinjite imasu. = Purei suru koto wo chikaimasu. We have seen on the news how resilient the Tohoku area people are, lining up for emergency food without complaining and keeping orderly and not panicking. Those people have lost everything, but they teach us how strong people can be in the face of disaster. = When it comes to disaster prevention, there was no school like Hashikami Junior High School. = Bousai ni wa chikara wo irete kimashita. = Our school has been working on disaster prevention. = Taisetsu na mono gayousha naku ubawarete kimashita. = Tasukeatte ikkite ikou to omoimasu. = Sorega watashitachi no shimei dakara desu. I would like to now tell you about a message from a 99 years old poet, 柴田トヨ = Shibata Toyo. She is the most well known female poet in Japan right now. She started to write poetry when she was 92 years old. Ever since she posted her heartwarming message in the newspaper, she has became very popular. Her words penetrate our heart like a raindrops in the desert. Her first book, くじけないで= kujikenaide = “Don’t be too frustrated” (or Don’t lose heart) has become a best seller. While がんばって (= ganbatte) is strong encouragement like “Cheer up!””Hang in there!” , くじけないで (= kujikenaide) is used to address people who are about to collapse and it sounds gentle while at the same time healing people’s wounded hearts. = Don’t be too frustrated / Don’t lose heart. = Yume wa byoudou ni mirareru noyo. And here’s her message towards people in the afflicted areas. = Aa nanto iu kotodeshou. = Terebi wo minagara tada te wo awasu bakari desu. = Kizuato ga sarani fukaku natte iruto omoimasu. = the mark of wounds has become even deeper I believe. = Ningen dareshimo no kimochi desu. = Watashi mo dekiru koto wa naidarouka? Kangaemasu. = Tengoku ni iku hi mo chikaideshou. = The day when I go to Heaven is also very close. = Minasama wo ouen shimasu. = Asa wa kanarazu yatte kimasu. * 応援歌 = ouenka = cheering songs collections! Music with encouraging lyrics cheer us up! Many of us are craving for songs to cheer us up. I will link to some of the encouraging songs that have been supporting many Japanese people through these hardships. The theme song of あんぱんマン= Anpanman. Because of its encouraging lyrics, it has become quite popular in Japan now. It reminds us of courageous 自衛隊=Jieitai = Japanese Self Defense Army, HyperRescues, firemen, workers of Tokyo Electric Power Company whose lives are endangered right now. I never expected the day when I would cry to the Anpanman theme would come! Actually KOKIA made this song after the Mid Niigata Prefecture Earthquake hit in 2004. Well, this is a super famous song known internationally as “Sukiyaki”. = Let’s walk looking up in order to not let our tears fall down. = Don’t give up. You’re almost there. Just a little bit further. = Tomorrow will come, for you! =Nihon wa fukkou ni mukete nagai michinori wo aruki hajimemashita. =Japan has started the long walk towards reconstruction. = Mina ni egao ga modori masu you ni. = Soshite Kaigai kara sasasete kureteiru minasan, aratamete arigatou! = And thank you again for all your support from all over the world. English version : Check here! this lesson is just wordless! itsumo watashi ni nihongo o oshiete kurete hontouni arigatou gozaimasu! nihongo ga donnani muzukashickutemo watashi ga settai ni ganbarimasu! kono lesson no uta no kashi no youni ne. Thank you for visiting this site. Also thank you for spotting the mistake. I fixed it. I join all the comments and…well I really don’t know what else to add to what has been said so far. Sometimes words are hard to find. Good point! I didn’t think it would confuse Japanese learners. 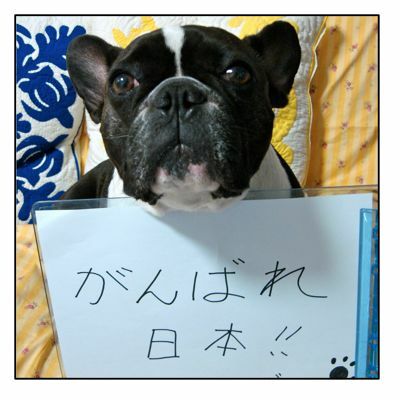 もっと is placed before adjectives or adverbs and modify them as well. Quite moving and educational lesson :), very very thank you,love it. The songs,all of them beautiful and encouraging. I wish i could live upto 100 years and have that clear, bright and wise mind as that lady poet Shibata Toyo. Yes, it will be great to live up to 100 and still can write those beautiful poems, huh? Yes sensei. There are a lot of people here who love Japan. I donated some money quite a few times through a Japanese supermarket here. The box is always full. I pray for all the victims of this terrible disaster. THANK YOU!! We hear the news of receiving support from all over the world almost everyday. We are deeply moved. I am sure Japanese people won’t forget about this kindness and do the same to other countries. After all, we are all connected. As long as there is a person like you who is concerned about Japan, we all can be genki again someday. !ochame!